Betty Who's debut album is not the standout debut that this charismatic pop star deserves. When Betty Who burst slowly emerged onto the already fully saturated pop scene she was hailed as the next Robyn -- filling the void that Robyn has left during the impossibly long time between albums. And while its tempting after listening to her two EPs (The Movement and Heartbreak Dream) and debut full-length album Take Me When You Go to argue that Betty Who is more than just a Robyn stopgap, it's not that easy the deeper you dive into her music, image and career. This Aussie born writer of more than just frivolous throwaway pop songs has a tough time to try and convince music listeners that she's unique in ways that are different to how Robyn is unique. She's got that power pop dance vibe going on where the beat pulsates and reverberates stronger than they probably should (so does Robyn); she's got that quirky cool pseudo-retro look going on (so does Robyn); she has a short blonde hairdo with a colourful fashion sense (so does Robyn); she writes pop songs that are smarter than they have any right to be (so does Robyn). So, why should you give Betty Who a chance? Well, because she's cool, and so is Robyn, and we have enough space on our iPhones for both their albums. Talking about Betty Who without drudging up the inevitable and unavoidable comparisons Robyn is almost impossible -- but now that it's out of the way, we can focus our attention on the much anticipated, and possibly too long to release, debut album Take Me When You Go, which for all intents and purposes struggles to find its footing as it flutters in and out of familiar tracks from previous records and new power pop tracks. The reality with Who's debut is it proves the old adage that there is such a thing as "too much of a good thing". While it tries really hard, and at times succeeds, in charming your pants off, the bubble-gum pop that follows familiar musical structures and predictable production techniques can be too much to take for more than 4 or 5 songs. While her EPs had the added benefit of not overstaying their welcome, the roundedness of a full-length album is necessary to capture and captivate the listener -- and Take Me When You Go fails in this respect. That's not to say there aren't some fantastic songs. Of the 13 tracks on the album 4 of them are remastered from her two previous efforts (including the runaway hit "Somebody Loves You" and "Heartbreak Dream"). "Just Like Me" opens the record with an overly polished funk vibe, that as a result fails to be funky, and dives into the love-song theme that does not flinch even for a second throughout the record (the entirety of the record concerns love songs, either reveling in its celebration or questioning its failure). The track is fun enough, but not a strong opener. "High Society" (pulled from The Movement EP) follows and is more inline with that pumped up love song energy that most of Who's music exudes--it's a perfect characterization of Who's charm. On it, she sings: "Won't you carry me away / After endless ballroom dreams / With you starting every day / We'll be high society / We'll drink Chardonnay through the day / 'Cause we say so / A silk lapel suits you well baby you know / With you each and every day / We'll be high society". It's cute and endearing and engrossing. It'll replace those bad guilty pop pleasures that you're too embarrassed to admit to liking with something you can sing along to with your friends. "Glory Days" continues the charming fun high energy pop started by "High Society" with an '80s power-ballad drum base and a super infectious chorus. "Somebody Loves You" is next, and if you're reading this, you probably know that song, and if you don't, you should -- it's glorious and you'll wish it was YOU who came up with the idea to dance to it down the aisle at your wedding. The album continues on in this manner with fun high energy pop songs and lower energy pop songs -- some you'll like, few you'll love, and few you'll hate. It's an album filled to the brim with tracks that, on their own, are really quite good, but lack enough diversity to keep you interested for all 13 songs. Which is kind of a disappointment, because Who is the kind of personality you really want to succeed at everything she tries. 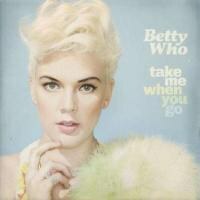 While Take Me When You Go isn't alienating in the slightest, it's not captivating enough to standout as the beauteous and glorious debut that someone as charismatic and enjoyable as Betty Who deserves. Here's to hoping her sophomore release blows it out of the water!